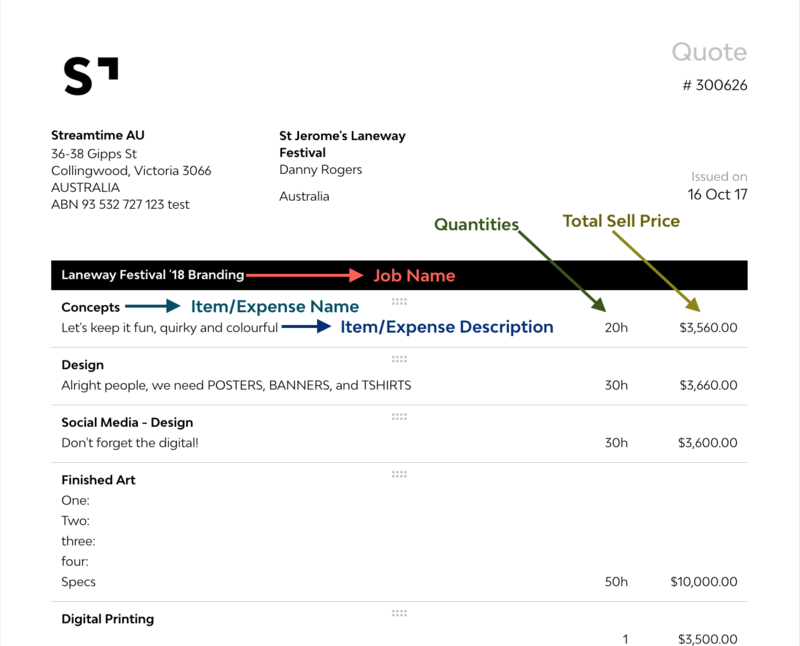 Can I customise the layout of my quote or invoice? Customise the layouts of your quotes and invoices so that your clients see them just the way they're meant to be seen. Customising quotes and invoices in Streamtime is just as easy as creating them. Once you've created a new quote or invoice, you'll notice that it will consist of the relevant Items and Expenses from the job, along with their accompanying descriptions, quantities, and total sell costs. Just about every field within the quote / invoice preview screen is able to be edited by simply clicking into it. This means that you can delete or add any information necessary for your client directly onto the quote / invoice. Clicking and dragging on the grab-bar on an item allows you to change where it sits on the quote, giving you full control over the sequencing of items. If for some reason you don't wish to quote or invoice a client for a cost that has been pulled through from the job, this item can easily be deleted by hovering just to the right of the item's price and clicking the trash can when it appears. If you delete items from your quote or invoice by accident, they can be restored by just scrolling up and clicking Restore deleted quote / invoice items. Use the tick-boxes in the Options panel on the right-hand side to toggle different elements of your quote / invoice on and off. Change the styling and placement of your company logo from the Settings panel. Your Master Terms & Conditions (and Payment Terms on invoices) can be setup and edited from the Settings Panel. Once you've finished customising your quote or invoice and it's good to go, it's time to send it off to your client.